« The 12 Days of Kurisumasu returns for Christmas 2011! Are you an artist that sells regularly in your friendly neighborhood anime convention’s Artist Alley? Or are you a small to mid sized dealer in anime/manga related goods looking to sell your wares at your favorite anime convention’s dealer’s room? Maybe you’re a cosplay photographer looking for a way to monetize your photography skills. Or perhaps your anime club or anime convention has an anime swap meet, where people can go sell their used stuff that’s cluttering up space in their room, and you’d like to give that a shot sometime? Odds are, you’ve probably had the burning frustration of not being to accept payment from a potential customer. Either they, ahem, don’t happen to have enough cash on them (if they even have any at all), or they try and foist a check off on you – and you know how risky that can be these days! Wouldn’t it be nice if you could accept credit cards? Just about everybody has either a credit card or a debit card (one that’s linked to a bank account) these days. Unfortunately, accepting credit card payments has, until now, been reserved for the big time business person. You’d have to set up a special merchant’s account with your bank (that costs money). You’d need to buy or rent one of those big clunky credit card processing machines (that also costs money). And you’d have to pay monthly fees to maintain your merchant status (and yes, that also costs money). Co-created by Jack Dorsey and Jim McKelvey (who are famous for another technology they created that’s gone big time, a little service called Twitter, Square is, to put it simply, credit card processing for the rest of us. You don’t need any special merchant account. You do need a bank account (this is how they send your payments to you), but it can be a regular old checking account at any US bank. After you create your Square account and add your banking info, they will ship you — for free — a small device that plugs into your iPhone, iPod touch, iPad or Android smartphone’s headphone jack. This little gem is a real credit card swiper. Download their free app (for iOS or Android). When you’re ready to take a payment from someone, you fire up the app, type in the amount of money you’re charging them (you can even add a picture and/or description of whatever it is you’re selling, assuming you’re selling something), and swipe their card (they accept the big 4 credit card companies: Visa, MasterCard, American Express and Discover). Then hand your phone (or iPod touch, or iPad) to the buyer. They sign their name on your device’s screen, and enter either a phone number or an e-mail address. The Square software automatically sends them their receipt (either by SMS or e-mail). And you’re all done! There are no monthly fees, and the Square reader is free. They charge a 2.75% fee per transaction (so, if you sell something for $20, their “cut” is 55 cents). This is actually fairly competitive with what regular credit card merchants pay, and is actually cheaper than PayPal’s fees. And there are no hidden fees or other funny business. Every few days, the money you’ve accumulated (minus Square’s cut) gets automatically deposited into your bank account. Easy peasy. And at any time you can log in to your Square account and get an up-to-the-minute accounting of your sales history, and can even download it in a form that you can easily import into a spreadsheet so you can perform all sorts of weird data analysis on it. Set up an account today and they’ll ship your reader right away. In the meantime, download the app for iOS devices or Android devices. Check out the videos below the cut to see Square in action. In addition, if you need to get a Square device quickly and don’t have time to wait for it to be delivered, you can buy one at a Best Buy or a Radio Shack store. 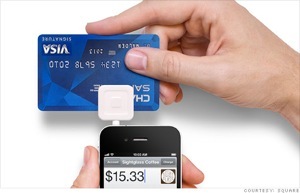 The device costs $10, and if you sign up for the Square service, Square rebates the $10. They’ve got them at Apple Stores too. Same $10-with-$10-rebate deal.